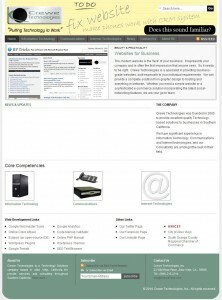 Crewe Technologies launches new website | Crewe Technologies, Inc.
Crewe Technologies has today launched their new website – http://www.CreweTech.com . “We are a Technology Solutions Provider” said Andrew Swingler, President of Crewe Technologies. “Today’s businesses increasingly rely on technology and we’re here to make it simple for them, and to increase their company’s efficiency. We’ve created the new website to give customers and prospects a clearer vision of what we’re all about”. The website will be continuously updated with tools and information for businesses wanting to know more about Technology, and how it relates to them.